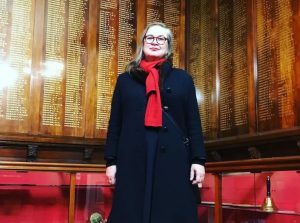 Award-winning composer Cat Hope will give a voice to the silenced when she returns to Perth to present the annual Peggy Glanville-Hicks Address on Thursday. Hope is currently based in Melbourne where she is head of the Sir Zelman Cowan School of Music at Monash University. The visit will be the first of several Hope will make to her hometown in the coming months. Glanville-Hicks had a stellar international career and the address named in her honour provides a platform to challenge the status quo and raise issues of importance in new music. Hope is a fitting choice for the address with industry experience as a performer, curator, academic and advocate for gender equality. Speaking on the phone from Melbourne she outlined her plans to use the Glanville-Hicks address to discuss gender inequality in the music industry. Hope’s advocacy for women and non-binary artists was galvanised by observing the treatment of women in public life. In a tangible demonstration of putting change into action, Hope’s address will include the performance of a new work commissioned from artists she would not normally work with. Melbourne metal singer Karina Utomo will perform a composition for voice and electronics created collaboratively by Hope and Polish-Australian composer Dobromila Jaskot. Utomo will also be starring in Hope’s first opera Speechless, to be premiered in February as part of the Perth Festival. In Speechless Hope’s concern for issues of social justice take on a large scale, as befits a work in the genre of opera which historically often drew on the issues of the time. The score is derived from drawings and graphics extracted from the 2014 Human Rights Commission report, The Forgotten Children: National Inquiry into Children in Immigration Detention. The opera retains the conventional structure of arias, recitative accompanied by orchestra but Hope expands the horizon of opera according to her experimental practice and philosophy of inclusivity. Utomo will perform alongside experimental vocalist Sage Pbbbt, Iranian-born singer Tara Tiba, opera singer Judith Dodsworth and a combined community choir of 30 voices. The opera has no libretto, instead the four soloists and choir will sing wordlessly (think Ennio Morricone mixed with experimental singer Cathy Berberian) in a fitting homage to people whose voices are rendered silent through political means. Instead the narrative will unfold through the music which will be performed by the Australian Bass Orchestra, an ensemble of low pitched instruments such as cellos, double basses, bass guitars, bass winds and brass, bass drums and electronics. Hope composes her music using graphic notation and the score for Speechless is derived from the format of The Forgotten Children report. The singers and musicians follow specific colours and literally ‘read’ the report, following the up or downward trajectory of graphs, children’s drawings and photos. The process may be unusual and technical, but Hope says the experience for audiences will be exhilarating. Perth audiences can have a preview of Hope’s compositional style performed by Utomo at the Peggy Glanville-Hicks address on Thursday night. Hope will also be performing with her award-winning ensemble Decibel on Monday night at the Subiaco Arts Centre. Since founding in 2009 the six-piece electro-acoustic ensemble has become something of an Australian institution, renowned for their pioneering work with graphic notation and their commitment to commissioning Australian composers. The Decibel concert explores the vinyl record as a sound source, musical instrument and score. The Peggy Glanville-Hicks Address is November 29. Decibel’s Revolution concert is December 3. Speechless will run February 26 until March 3. Picture top: singer Karina Utomo. Photo: Paul Tadday.